Cyprus folk dances are the expression of feelings, thoughts and enjoyment of Cyprus people. The Turkish Cypriot people do their folk-dances at the ceremonious occassions such as marriages, kina nights, harvest days, etc. These dances are generally performed in the following sequence : meeting dances, henkerchief dances, "zeybek" dance, women dances, dramatic dances, and butcher dances. Meeting dances consist of men and women gathering. The women's dances are generally slower in tempo. Cypriot men used to dance mostly during Cyprus wedding festivities and at various junkets on high days and holidays, but also in coffee-houses in the evenings, on threshing-floors, and wherever men gathered together. Social convention restricted women to mainly dancing at weddings. 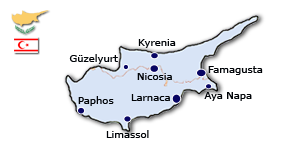 Cypriot dances are mainly of the type performed by a confronted pair, invariably two men or two women, or men's solo dances displaying virtuosity and often performed with a hand-held object, either a sickle, knife, sieve, or tumbler. In their steps and general characteristics - such as the movement of the body and limbs - they have features in common with dances of the historic Greek island area (the Asia Minor seaboard, Aegean islands and cities, and the Ionian isles). Apart from these common features, Cypriot dances are distinguished by steps peculiar to certain localities, such as stamping in one spot with the feet, crossed alternately in front of each other, in the "second" and particularly the "third" ""kartchilamas"" and in the "syrtos" for men. Improvisation is another characteristic of Cypriot dances and may be attributed to their being performed by only two people and so to an overriding sense of comparison and, by extension, of competition. But it is to be noted that improvisation and the freedom of the dancer to do his own thing are constrained by the community's severe strictures upon any excesses. Indeed, the more inward-looking the community, the more rigorous the restraints.